Clathrates: Tiny cages enclosing single atoms are shown. Researchers at the Vienna University of Technology (TU Vienna) have developed a material that can turn waste heat generated by machines into electricity using the Kondo effect and clathrates. Researchers have designed a material that traps cesium atoms inside a lattice structure (clathrate). 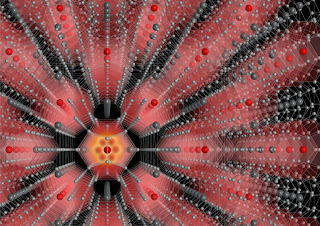 When the material is exposed to heat, the trapped atoms start vibrating within its lattice 'cage' and electricity is generated. This is due to the Kondo effect. Named after Jun Kondo, a theoretical physicist from Japan, the Kondo effect describes how the electrical resistance of a metal increases when the temperature is lowered up to a certain point, known as the Kondo temperature. The current research shows that the Kondo effect can also apply to very high temperatures. What this means is that applications can be developed that will take advantage of waste heat produced by machines that can turn it into useful electrical energy rather than it being dissipated into the environment. A lot of energy is wasted when machines turn hot, unnecessarily heating up their environment. Some of this thermal energy could be harvested using thermoelectric materials; they create electric current when they are used to bridge hot and cold objects. At the Vienna University of Technology (TU Vienna), a new and considerably more efficient class of thermoelectric materials can now be produced. It is the material's very special crystal structure that does the trick, in connection with an astonishing new physical effect; in countless tiny cages within the crystal, cerium atoms are enclosed. These trapped magnetic atoms are constantly rattling the bars of their cage, and this rattling seems to be responsible for the material's exceptionally favourable properties. "Clathrates" is the technical term for crystals, in which host atoms are enclosed in cage-like spaces. "These clathrates show remarkable thermal properties", says Professor Silke Bühler-Paschen (TU Vienna). The exact behaviour of the material depends on the interaction between the trapped atoms and the cage surrounding them. "We came up with the idea to trap cerium atoms, because their magnetic properties promised particularly interesting kinds of interaction", explains Bühler-Paschen. For a long time, this task seemed impossible. All earlier attempts to incorporate magnetic atoms such as the rare-earth metal cerium into the clathrate structures failed. With the help of a sophisticated crystal growth technique in a mirror oven, Professor Andrey Prokofiev (TU Vienna) has now succeeded in creating clathrates made of barium, silicon and gold, encapsulating single cerium atoms. The thermoelectric properties of the novel material have been tested. Thermoelectrics work when they connect something hot with something cold: "The thermal motion of the electrons in the material depends on the temperature", explains Bühler-Paschen. "On the hot side, there is more thermal motion than on the cold side, so the electrons diffuse towards the colder region. Therefore, a voltage is created between the two sides of the thermoelectric material." Experiments show that the cerium atoms increase the material's thermopower by 50%, so a much higher voltage can be obtained. Furthermore, the thermal conductivity of clathrates is very low. This is also important, because otherwise the temperatures on either side would equilibrate, and no voltage would remain. "The reason for these remarkably good material properties seem to lie in a special kind of electron-electron correlation – the so-called Kondo effect", Silke Bühler-Paschen believes. The electrons of the cerium atom are quantum mechanically linked to the atoms of the crystal. Actually, the Kondo effect is known from low temperature physics, close to absolute zero temperature. But surprisingly, these quantum mechanical correlations also play an important role in the novel clathrate materials, even at a temperature of hundreds of degrees Celcius. "The rattling of the trapped cerium atoms becomes stronger as the temperature increases", says Bühler-Paschen. "This rattling stabilizes the Kondo effect at high temperatures. We are observing the world's hottest Kondo effect." The research team at TU Vienna will now try to achieve this effect also with different kinds of clathrates. In order to make the material commercially more attractive, the expensive gold could possibly be substituted by other metals, such as copper. Instead of cerium, a cheaper mixture of several rare-earth elements could be used. There are high hopes that such designer clathrates can be technologically applied in the future, to turn industrial waste heat into valuable electrical energy.